Here we present some links to other web resources about the Kelb tal-Fenek and its country of origin - Malta. The official website of the Maltese government. Includes information about ministries, law, economy, science and culture. Website of the Malta Tourist Authority. With information about travelling to the country of origin of the Kelb tal-Fenek, accomodation, sights, addresses etc. The website of a non profit charity organisation which cares for abandoned and stray dogs in Malta. Here you find also some photos and stories of dogs that look for new homes. However, you will rarely find a Kelb tal-Fenek among these dogs, since the Maltese Kelb tal-Fenek owners do highly appreciate their dogs and do well care for them. A similar organisation on the island of Gozo. Various information about hunting in Malta, game, hunting methods, law, press releases. 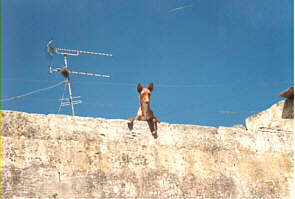 Website of an amateur canine organisation in Malta. The Malta Kennel Club (MKC) organises dog shows under the auspices of the Fédération Cynologique Internationale (FCI). Disclaimer: Although we make every effort to check all the contents of this web page we nevertheless accept no liability for the contents of external links. The contents of external links are the sole responsibility of the proprietor.